The 10th house rules your career, social status, authority figures, and life path. 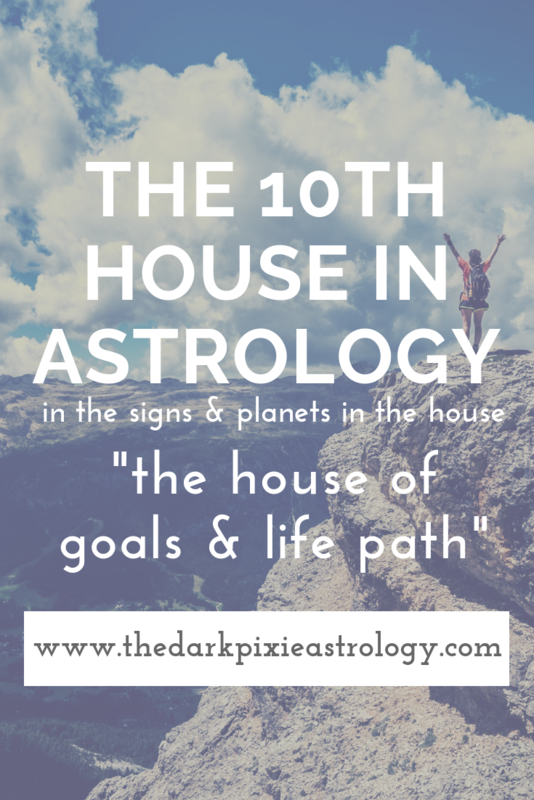 What kind of career you'd do best in can be found by the sign on the cusp and planets within the house. Along with the 2nd and 6th houses, it's one of the career houses and shows what professions a person would be best at. Your social status and rank also fall under the 10th house, and how you need to be ranked (it should come as no surprise this house also rules politicians). Authority figures, those above you that you must answer to or look up to, fall here (like bosses). This house is on an axis with the 4th house and is also called the Medium Coeli, MC for short, or more usually the Midheaven. Both houses rule your parents, with one house ruling one parent and the other house ruling the other. Both are also spiritual in nature, and the 10th house holds influence over your life path and future. Capricorn and Saturn rule this house, and it's an angular house. You’re comfortable in the spotlight, and aren’t afraid to embark down a new path. You can be impulsive in your decision-making, especially in regards to your career and life path, and need to give yourself enough time to know what you’re doing and where you’re going. You’re ambitious, driven, and hard-working once you figure out what you want to do with your life. Your career can be something Aries-related, like in the military, as an entrepreneur, in sports, or something competitive. You can be controlling with your career, and have a hard time giving up control when you need to. You want to be seen as someone who has status and wealth, no matter how little you may have. You carry yourself with charm and seem sensual. You can take time to make progress in your career or with your goals, and aren’t in any rush. Working in the arts could be best for you. You can also do something Taurus-related that uses your senses, or in finance. You require a lot of activity in your career, and get bored easily. Something mentally stimulating may be best for you, or where you can use your hands. With Gemini here, you can have two different careers in life, maybe even at the same time. It might burn out most people, but you need the activity. You can have a career that’s Gemini-related, like writing, speaking, detail-oriented work, planning, with younger people (like teaching), or using your mind in some way. You care deeply about your career and success, and because of that, can experience some upheaval and fluctuations until you finally devote yourself to something. You want to be seen as someone who knows what they’re doing and can be looked up to. You can be quite ambitious, creative, and helpful of others once you do pick a career. You can have a career that’s Cancer-related, like dealing with the public, nurturing others, in or for the home, or with or for family. You need to shine in your career, and want to be recognized for your work and receive praise. Working in the public eye could suit you well. You work best on your own because you’re too dominating of other people. You’re proud of your accomplishments, and of where you are in life. You can have a career that’s Leo-related, like in the public eye (this is the most common 10th house placement for celebrities), through work that helps other people, or work that makes people laugh. You need plenty of mental stimulation in your career, or you get bored quickly. You do best in work that’s in service of others, that involves the usage of your mind, and where you can exchange ideas freely. You prefer conventional jobs in conventional places. You can choose a career that’s Virgo-related, involving the details, something with your mind, as an organizer, bringing structure or creating routines, with health, or with animals. You likely need a career that involves someone else, and have most of your success when you’re working with a partner. You need them to be an equal, and you want to divide the work fairly. You come across as charming and graceful in public. You take your time deciding what to do in your career and with your life path, weighing your options, but you can vacillate too much and never decide what you want. You can choose a career that’s Libra-related, like in the arts, the law, the beauty industry, fashion, or the wedding industry. You can become obsessed with your career, dedicating yourself to it fully and being quite ambitious. You have incredible focus and such a strong will that success is almost a guarantee as long as you don’t self-sabotage with extreme emotions and destructive actions. You come across as powerful and strong in public. You can choose a career that’s Scorpio-related, like in science, dealing with secrets, helping people transform themselves or transforming items/property, or in finance. You have an optimistic attitude with your goals, and while you’re hard-working, you don’t lose yourself in your work. You may not dedicate yourself to any one job either, and have several different careers in your life. You come across as jolly and optimistic, and you’re a natural salesman. You may choose a career that’s Sagittarius-related, like in travel, teaching, writing, speaking, expansion, or dealing with foreign cultures/people. You take your career very seriously, and work harder than most to achieve what you set out to do. You take the slow, steady, cautious approach, and come across as determined and practical. Success likely comes later in life, after years of hard work and slow progress. You may choose a career that’s Capricorn-related, like in politics, as an entrepreneur, working with people older than you or with your parents, or helping those older than you. You do things differently in your career, and take an innovative approach. You think very long-term, and know what you want long before you even get started. You may work best in a group, or doing something in the public eye, though you’re not comfortable in the public eye, and would prefer if only your work be recognized and not you. You can choose a career that’s Aquarius-related, like in technology, as an inventor, in science, helping people realize their dreams, or that focuses on the future. You have difficulty figuring out what you want to do with your career and the path you want your life to go in. You need to learn to be more practical when making your decisions. You can do work that helps other people, or allows you to express your emotions publicly through something creative. You can choose a career that’s Pisces-related, like dealing with spirituality, the metaphysical, the arts, or helping others. Your career means most to you, and you want to succeed no matter what. If you’re not a success, you feel emotionally distressed and insecure. Having your professional life on track is a goal, and you can be quite ambitious. But your emotions may get the best of you at times, and prevent you from being logical enough to do what’s needed for success. Ideally, you should have a profession that allows you to express the Moon in some way, like cooking, or something nurturing like a caregiver, or something to do with the home. You may work in the public eye or with the public. You emotionally desire recognition for your work, and may care greatly about your status in life, being charming and appealing. Be leery of getting trapped into trying to “keep up with the Joneses.” If you can stop yourself from being like that, you can be very practical, and can attain the goals you truly want, rather than being concerned with what everyone else is doing. Having career success may be more important to some of you than having a strong private life, and many will struggle with trying to find a balance. With your natal Venus in your 10th house, you come across as very charming, and this attracts many people to you, but you tend to keep them at a distance. You want people to view you as charming and beautiful, and can put too much stock in what other people think of you. You may be attracted to people who are much older than you, and have an easy time dealing with parents, bosses, and mentors. The 10th house rules your career, and you can go into a career in the arts, the beauty industry, law, or doing something creative. This placement can sometimes show someone who’s in love with their career, and many workaholics have Venus in the 10th house. With your natal Mars in your 10th house, you have a passion for success. You want to succeed in life, and have the drive to accomplish. You know what your long-term goals are, and you know what hard work you have to put in to attain them. You work hard, are focused on your career, and on the direction your life is going in. You take this seriously, and you know that no matter what you have to sacrifice now, it’ll be worth it if you get what you want in the end. You can be a little cold personally as a result, and some of you may be tragically ambitious. Since the 10th house is the house of career, you could work on your own, in sports or physical fitness, in the military, or in the entertainment industry. With your natal Jupiter in your 10th house, you want to succeed in your life, but you try not to be tragic about it. You’re positive about your goals and ambitions, and treat people well along the way, making many useful connections. You look up to people who have achieved something in their lives. The 10th house rules your career, so Jupiter here can show that you have a career with writing, speaking, travel, language, dealing with other cultures, the law, or teaching. This can be a good position for you to have career success in your life, almost coming easily, which can make some of you more lazy with career matters. With your natal Pluto in your 10th house, you’re highly ambitious, perhaps tragically so. You feel connected to your purpose and life path, and you strive to succeed no matter what. You can be powerful in your career, or have control issues in your career. You need to deal with past issues and allow yourself to transform. Since the 10th house rules your career, any planet here can show the career you choose in life, so with Pluto here, you can have a career in research, science, the occult, hidden things, transformations, using other people’s money, forensics, or psychology. With transit Mercury in your 10th house, you have more conversations about your career and the direction that your life is going in. You think about these and what your goals are, and how you can get from where you are to where you want to be. You can think about the big picture, and be realistic with your plans, so this is a great time for making long-term plans. You know exactly what you can do and need to do, and take a practical approach to situations. If you’re a writer or work in communications or with technology, this is a good period for you. You could have an important conversation with a boss, parent, mentor, or other elder.